Staying up late signing 30 cards for my classmates was how I usually spent my February 13th when I was in elementary school. Did you do this too? I freakin’ loved celebrating Valentine’s Day as a kid. Making a mailbox for my desk then going around delivering cards and candy to every kid on the day of was the best thing ever! I totally miss those days…. But luckily I have you, an amazing member of my audience, to 💖 on this year. I just want to take this moment to tell you I LOVE having you in my community, and I hope you have a fantastic Valentine’s Day tomorrow. If there is anything I can do support you in your biz let me know. My goal is always to make the best content possible for you. Just hit reply to tell me! P.S. 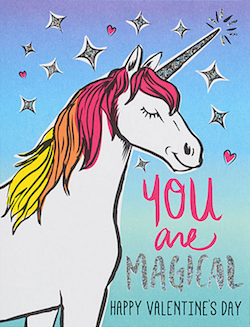 Have you joined our private Unleash Your Inner Unicorn Facebook community yet? I’m doing exclusive training videos there weekly, and I’d love to have you join the fun!